First we are entertained by a Circus On Ice, which besides the chimp, offers up the Rockettes and a Russian ballet, all on skates. 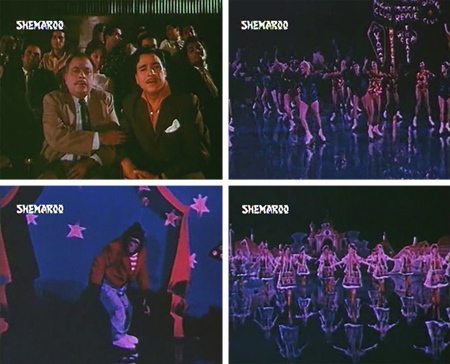 Jagdish (Madan Puri), his business partner Mr. Kapoor (Bir Sakhuja), Kapoor’s daughter Rita (Ragini), Dr. Sharma—who has a lab full of bubbling vials, rats, bunnies and monkeys, and a fake beard and mustache that spend much of the film coming unglued from his face—and the Comic Side Plot set off on a cruise ship. I am not quite sure what they are in pursuit of, besides a good time, but I’m *guessing* that it’s a scientific expedition (really, who needs subtitles). They disembark in the tropics. The evening’s entertainment: a lovely dance at the Hotel Malabar (courtesy of Madhumati and Rani); and the next morning they’re off into the deep deep jungle. Alas! Rita is separated from the group when she’s swept away by the river current. She makes her way to unknown shores which are occupied by ostriches, red spotted deer, zebras, and a very hungry tiger. These animals are not even indigenous to each other, let alone to wherever it is that they are supposed to be. Anyway. She is gallantly rescued from the jaws of death by our shikar hero Ajit (Ajit). 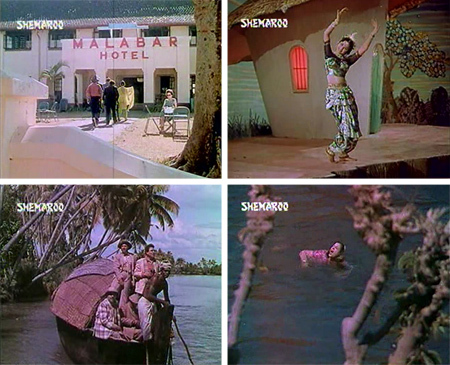 Ajit takes Rita to the timber estate where he lives and works. Romance is in the air! He sends a message to the rest of her party via a tribal drummer and sure enough, they all show up the next morning. Rita celebrates the happy reunion with a dance. Totem poles! Chinese dragons! Oh my. Kapoor convinces Ajit to accompany (or guide) them, and they set off the next day. Adventures come at them thick and fast! 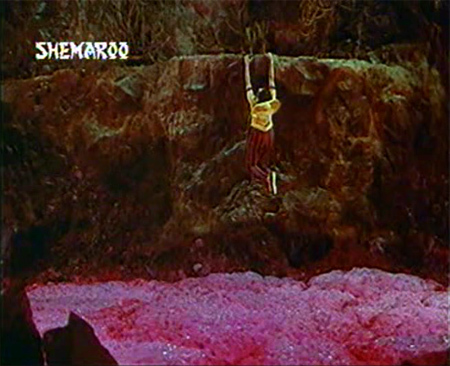 First, there’s some dishum-dishum with a decorated tribal type (Shyam Kumar—who looks sort of like a sullen Feroz Khan). 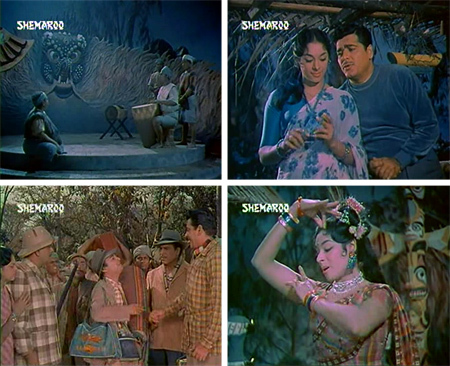 Then Ajit and Rita romance each other some more with a song, which causes Jagdish to bristle (I love Ajit’s do-rag). Worse is yet to come, though! Our friends come up on the edge of a frothy pink volcano, and as they start to cross a giant ape appears. In her fright, Rita loses her footing and falls in, catching herself on a stone ledge. Bachao! Can she be rescued? Where did this giant ape come from?? Tune in tomorrow to find out! Posted on November 22, 2008 at 10:53 am in Hindi movies	| RSS feed You can skip to the end and leave a reply. You’ve already got me in splits! I saw this movie ages ago, when I was a kid and remember being in a constant state of bewilderment: “What the hell is happening here???! !” Much discussion with elder sister and equally befuddled reactions from her. 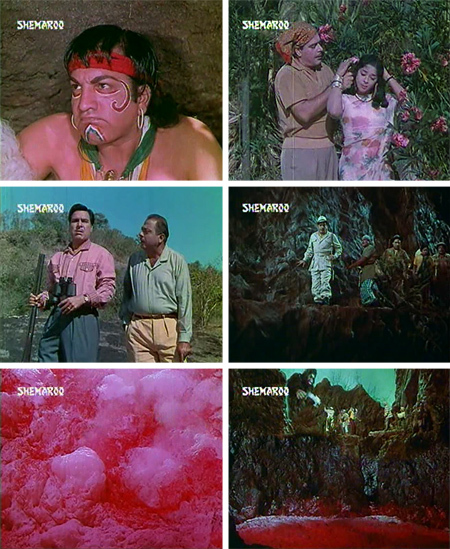 I don’t recall much except that it was utterly unbelievable, and that it had some great songs…there’s one with a corpulent Ajit and a fairly hefty Ragini dancing about among rocks and waterfalls and stuff, as far as I can remember. Can’t wait to read the next instalment! Ah yes, Ajit was getting a little past his hero prime here. Ragini seems like a nice normal size, although some of the capri pants she wore didn’t do her any favors. Your review has left me too emotional to write a coherent comment. No pressure, of course, but can you write part two right now? BUBBLEGUM LAVA!!!! MORE MORE MORE!!! Amore. PS – they set off for an adventure in a houseboat? heee. Todd: Part 2 will be up tomorrow, I promise. I thought of you incessantly while watching this. And the best part is, is that it only gets better. BETTER. Amrita: LOL @ bubblegum! It’s exactly that color. And yes, they traveled by (Kerala) houseboat, by ferry, by jeep—seemingly for a very very long time before they reached the jungles of…whatever land it is that hosts all those animals in the wild. A giant ape and Ajit as a hero! This is my kind of movie! memsaab, Fantastic! Perfect antidote to working-on-weekend blues….I just thought that I should point out that capris rarely do any “normal” sized woman any favors! This must be the only movie I’ve watched where a monkey has been devoted enough screen to be considered a second hero! Rum: Oh, Ajit was so handsome in the 50s. But he is such a great loony villain that I’m glad he changed paths too :-) He’s getting a little past hero in this one…and it’s not just a monkey, it’s a GIANT monkey. I got it for the songs, but was rewarded with SO MUCH ELSE. Yeh…the ice-skating chimp appeared about 3 minutes in, and they had me too. Riveted. 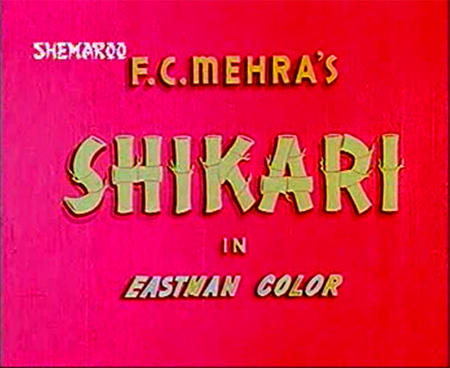 I confuse between “Shikar” and “Shikari” all the time and both movies belong to the same era. Hi squarecut.atul (love your name, how did you come by it? ): Thanks for all your comments :-) I’m always happy to find fellow fanatics of Hindi cinema! I have visited your blog before, and would be very happy if you continued translating songs into English! It’s not as easy to find translated lyrics as you’d think. Cheers! Well Atul is my name. Squarecut is my nick in forums. Theefore I picked the name squarecut.atul for blogging. Well, I will start translating the songs in my blog. Well, the blog that I have not updated is a logspot blog (squarecutsblog.blogspot.com). The blog that I am concentrating on these days is http://atulsongaday.wordpress.com, where I posts 3-4 songs daily.